I know its tough to stay smooth for the summer, especially when you live in the sticky, sweaty humidity that is Virginia weather! 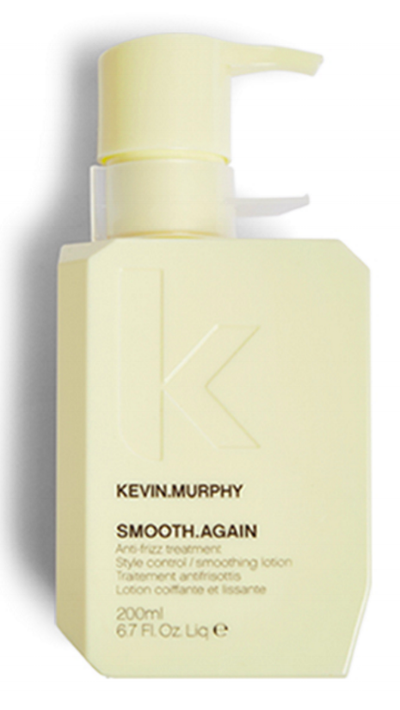 Here are my absolute favorites in the smoothing series by Kevin Murphy. These 4 products will do half the work for you in the battle with frizz for the summer. Below you will see some more info on each and a nice video that explains the benefits and how to use each product. As always, come on by and let me know if you have any questions. Keep an eye out on FB/Instagram for deals and promos, like the occasional flash sale. To the the early bird scoop, subscribe to the newsletter. Smooth Again leave in anti frizz treatment with styling ability and heat protection. This video is actually only about a minute and a half long so don't get panicked you are going to get bored with this one! He gets right to the point letting us know the features and benefits of this product. If you want more muscle and staying power in your fight against frizz, give me a call with any questions about the new keratin treatments I'm offering. More info on the next blog post! Shouts out to the Kevin Murphy website for all of the amazing videos and information about their products. To see more, check them out here. I love the product finder quiz!! I hope you like what you see! If you know someone else who would like to keep up with what is going on at the RLB shop, forward this on and subscribe!